If you could wake up as an astronaut or go to sleep as a pirate, wouldn’t you take the chance to do it? OK, so maybe not every day (you presumably have some kind of work/life commitments that would prevent you from sailing off to plunder the seven seas at the drop of a hat), but every now and then, it’s definitely not hard to understand the drive for a bit of escapism. It’s no wonder that it’s the stuff that kids thrive on; they who, strangely enough, often seem to have almost nothing escape from. 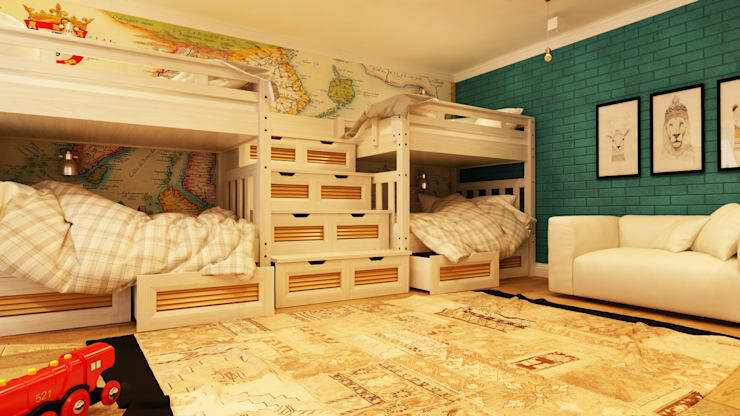 A themed bedroom that plays up to their storybook fantasies is a fun and simple way to bring an extra sprinkling of magic into your children’s lives, at the same time as giving their imaginations a boost. Check out these cute ideas for doing it right. Dreams of flight are among the most common ambitions in childhood – and they’re also among the easiest to cater for in the design of your child’s room. Hanging mobiles of aeroplanes, rocket ships, clouds or planets is a simple way of bringing the heavens down into their room; while blue or navy colour schemes and star wall art will help take things that little bit further. 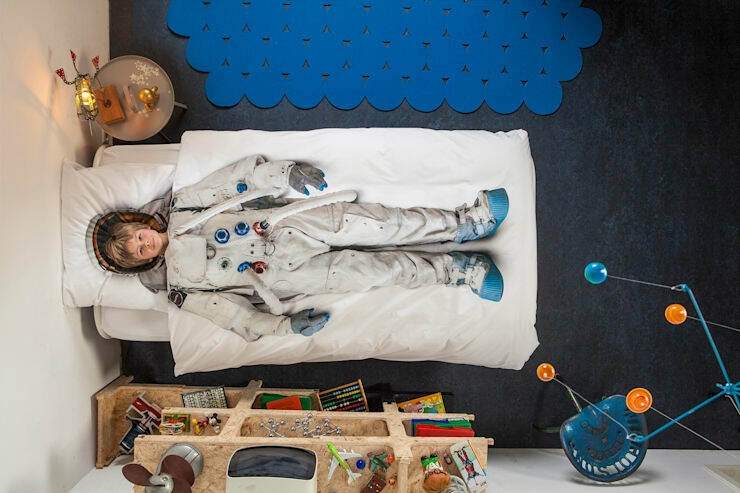 Or, as seen here, you might want to invest in a spacesuit bed set, to help ensure their dreams will be truly stellar. 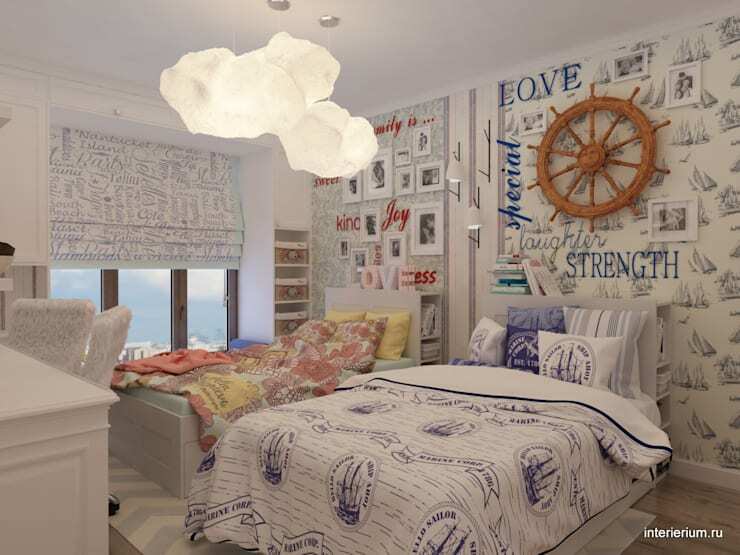 Even if you have two children with differing tastes and only one bedroom for them to share, you can still take their individual dreams and goals into account when designing their room. In this case, only one of the two children who live here seems to have a strong enough passion for their imaginary vocation to warrant decorating the room with that in mind. Whoever occupies the blue side of this room obviously has all things nautical on the brain – an enthusiasm not shared by the room’s other resident. By choosing different wallpapers, wall art and bedding for the two children, however, both tastes are covered. On a side note, that fluffy cloud light is a piece that would work well with many themes, such as the flight theme suggested above. If the sailing theme seemed reasonably subtle when the room was viewed from the other side, this shot should clear up that false impression. This room – again, it’s shared – is filled with things to keep kids with itchy feet and adventurous spirits satisfied. The full-wall world map is just what every aspiring explorer needs to launch their dreams of future journeys. Choosing a toy your child particularly likes and incorporating that into their bedroom can help them to be more imaginative in their play, particularly if the toy is a constructive and creative one such as Lego. 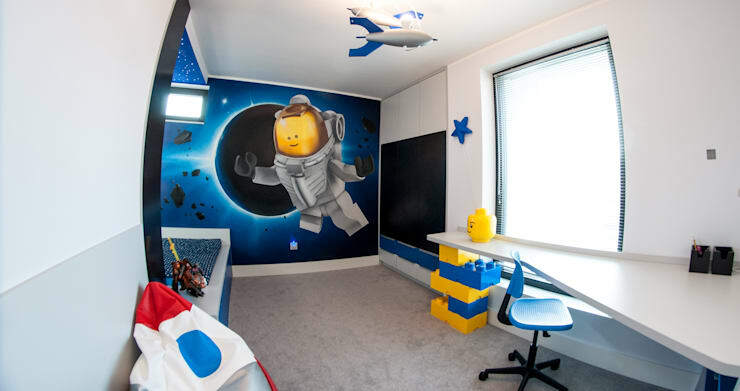 There are many, many ways to make a Lego-themed room work; in fact, the option seen here is relatively reserved, given how many crazy construction possibilities Lego offers. This room, incidentally, does a good job of killing two themes with one stone, neatly combing Lego and space travel. 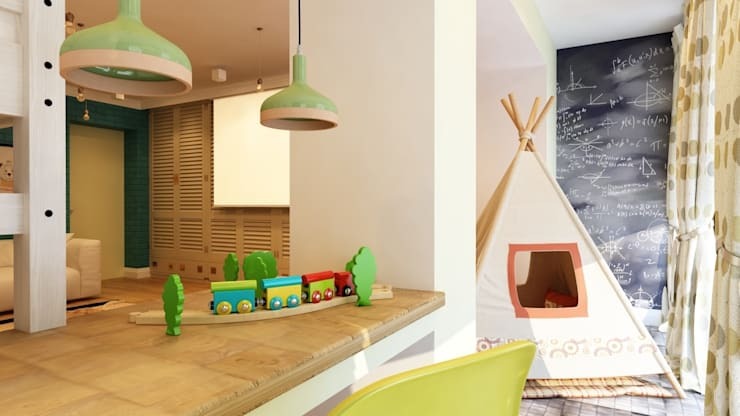 Animal-crazy kids can bottle-feed adorable lambs to their hearts’ content in this cosy, quirky room, which is perfectly suited to the rustic wooden structure and exposed wooden ceiling of the house that contains it.